Hallgrímskirkja Church - Now, I'm not particularly a huge tourist when it comes to churches/buildings in general, but the church allows tourists access to its tower for about $10 USD. The 360 views of the city from the top were absolutely breathtaking--that's where my first photo was shot from! Sun Voyager Sculpture - Definitely a cool and different piece for those of you into the art scene. The sculpture is placed right next to the sea with pretty incredible views of the snowcapped mountains beyond. Harpa - The concert hall of Reykjavik that does a little light show once the sun sets. The honeycomb architecture all lit up at night is definitely a must-see. For Coffee - Reykjavik Roasters, literally one of the cutest coffee shops I have ever been to. Their coffee is fantastic and pastries are absolutely divine! For Brunch - Bergsson Mathus, couldn't leave Reykjavik without doing brunch the Icelandic way! A very satisfying sampler of breakfast food in Iceland, consisting of yogurt, bacon, bread, hard boiled egg, potatoes, cheese & fruit. Hearty, indeed! For Lunch - Svarta Kaffid, the homemade soup that literally changed my life. I will have dreams of the soup that comes out in hallowed out bread bowls. Yes, you read that correctly. Revolutionary. For a Snack - Baejarins Beztu Pylsur, couldn't pronounce this little hole in the wall shack, but my god they can make a good hotdog. One of the most satisfying (and cheapest) eats in the city. Guilty of going back for seconds...and maybe thirds. For Dessert - Ice Cream from Valdis, the coconut with chocolate shavings and coffee flavors are pictured above. Very generous with the scoops they give out, and that coconut is the best I've had to date. Laugavegur Street - Lots of cute little shops all lined up. This entire downtown area is absolutely lovely. 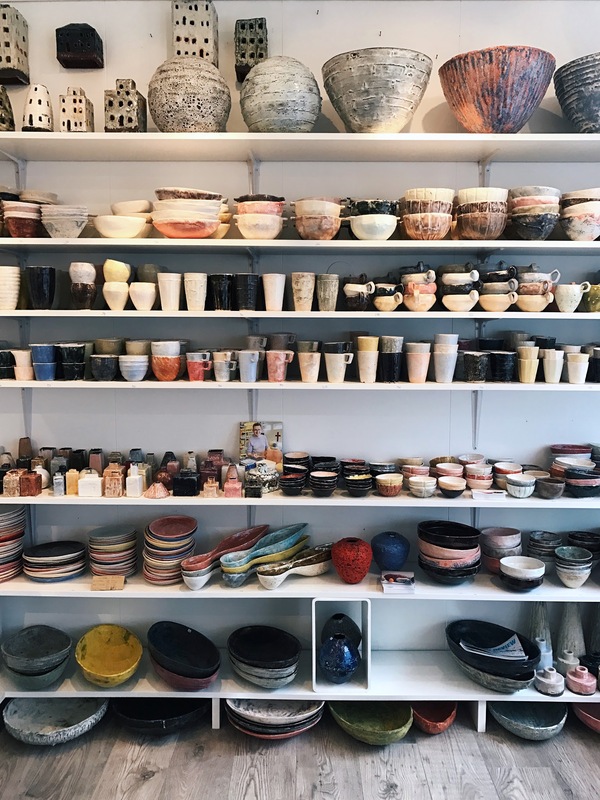 I can't quite recall where exactly we were able to get ceramics, but the pottery was phenomenal. Hand crafted, hand painted...couldn't resist bringing a mug back for everyone! Hope this was a helpful little guide to exploring Iceland's capital city! Next up, tackling the best of what Iceland has to offer: The Golden Circle & National Parks!